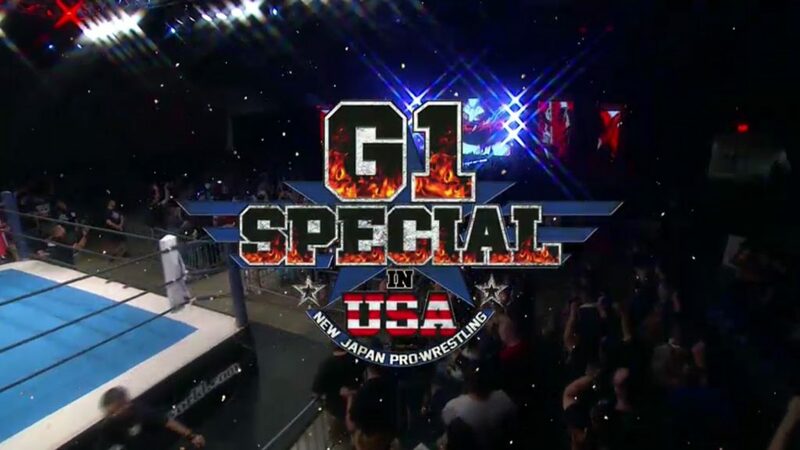 The future starts now with the G1 Specials in USA and the crowning of an IWGP US Champ. This was a good opener. It was fairly fast-paced and felt fairly short. Both teams looked good, but it really felt like a showcase for KUSHIDA and Liger more than anything. Very good match. Omega started by nearly immediately going after Lethal’s injured ribs. Lethal manage to fight back and hit an early Lethal Injection. Omega escaped an early pin attempt, but Lethal took control of the match from there. He was very aggressive and looked faster than he was last night. It felt like he was trying to end the match quickly because of his ribs and because there’s would still be another match for him if he won. This seemed to play into Omega’s hand somewhat, and he seemed to absorb punishment and bide his time until he could find the most opportune moments to strike back. This was an interesting match to watch and was very entertaining. Very good match. Sabre had a very strange game plan going into this match. He started by initiating a series of strikes with Ishii, practically inviting Ishii to strike back. Ishii did strike back, and unsurprisingly Ishii got the better of the situation. Seemingly learning his lesson, Sabre moved on to what he does best: submission holds. He wrapped up Ishii in a number of holds, one of the best sequences being a moment similar to how Sabre won his match against Juice Robinson last night. He had Ishii in a submission near the ropes, but he kept adjusting and repositioning himself every time Ishii got close to a rope break. This match was a good battle between scientific holds and pure power. As I stated though, Sabre tried to do both at times, and I think that gave Ishii an edge in the match overall. This is a great match because it rewards those who like to pay attention to small details, but it also has a number of huge power moves that completely changes the momentum building in the match. Good match. This one was fun. Los Ingobernables dominated the first part of the match, but the luchadores started taking over after a while. I feel like the ending could have been a little more exciting. It broke down about like you’d expect, but the actual finish felt a little underwhelming considering the buildup to it. Good match. This was a bunch of really big guys (and Hangman Page), so the action wasn’t as fast-paced as the matches so far, but it was certainly heavier. There wasn’t much in the way of a proper tag match. It was mostly just everyone coming in and out of the ring as they please, hitting power move after power move. This finish to this one caught me a little off guard, but I liked it. Naoki Sugabayashi, the chairman of NJPW, thanks the fans and says New Japan will be back in the USA in 2018. Very good match. It started in a similar way to the recent match between these two teams at Dominion. There was a little back and forth, then Matt Jackson hit Beretta with a powerbomb on the apron that affected Beretta’s ability to contribute to the rest of the match. Romero was isolated and double-teamed by the Bucks for a very long time. Eventually Beretta was able to get back in the fight, but the Bucks focused on his back which kept Beretta at an extreme disadvantage. By this time both members of Roppongi Vice were hurting bad, but they still managed to mount a believable offense. Overall the Young Bucks dominated this match. Almost exclusively. There were a few moments when RPG Vice looked like they might be mounting a comeback, most notably when Beretta hit Nick Jackson with a quick succession of very strong moves, but the finish to this one felt inevitable after a while. It was still fun to watch though. After the match, Ricochet attacks the Young Bucks. Ricochet says the Young Bucks have every right to call themselves the best in the world, but he wants to challenge them for their Jr. Tag Titles with Ryusuke Taguchi as his partner. Matt Jackson seems to agree to the challenge. In the ring, Rocky Romero talks about the five year plan he and Beretta discussed three years ago. They’ve already accomplished two of the things on that list, so now it’s time for the third. Romero gives his blessing for Beretta to move up to the heavyweight division without him. The two men hug and hit a high five. This was a fun match. There was an awful lot of comedy in the beginning which was alright. Then the action really started and it was also alright. This felt like an easy night for everyone involved, but it was still an entertaining match, even if it was a little forgettable. Billy Gunn and Hiroshi Tanahashi talk about their upcoming IC title match. This was pretty good. Billy Gunn dominated by going after Tanahashi’s injured arm right from the start. The match felt very methodical and maybe a little slow at times, but I still liked it alright. If nothing else it was good to see Billy Gunn in such a high-profile match. Really great match. It started out as a bit of an Ishii match with both guys throwing and inviting strikes. Omega eventually started to make it more of his style of match, manipulating Ishii into different situations and getting a little support from the Young Bucks at times. The Bucks never attacked Ishii, but in one instance they did set up a table while Omega was distracting the referee. That was their type of support. The match went on for quite a while, and the intensity gradually ramped up as it went along. The action came in waves here and there, but overall it simply got faster and more intense as it went along. The final portions of the match were full of huge strikes, moves, and sequences, and plenty of near falls. This was a great outing by both guys and a great finish to the tournament. Kenny Omega is presented the IWGP US Heavyweight Title, but Cody rips it out of his hands. The two men stare at each other for a few seconds before Cody hugs Omega and puts the US Title around Omega’s waist. The rest of Bullet Club then heads to the ring to help Omega celebrate his victory. Omega gets on the mic and says it’s been a difficult year. It’s been a difficult year for everyone. He says that it can be difficult for people who were brought in just to do a job to succeed, but the Bullet Club has done just that. He thanks the fans in the crowd for helping them succeed and says that New Japan will be back and bigger than ever. Also, Bullet Club will rule the wrestling world. Omega says all Bullet Club has ever wanted to do is remake wrestling in its image. Tonight’s win is just the beginning. This was another very good show. I think the tournament matches were easily the best matches of these two shows, especially here on night two. All of the tournament matches had something interesting about it, whether it was a unique pairing, an injury, or whatever. There were also some pretty big moments on tonight’s show, such as the breaking up of Roppongi Vice and, of course, the crowning of the first US Champ. I think I liked the non-tournament matches better on night one, but night two might have been better overall. It’s difficult to say. Either way, this was a great set of shows. This was the match of the weekend. Easily. TAGS: Bad Luck Fale Beretta Billy Gunn Brandi Rhodes Bullet Club Bushi California Chaos Chase Owens Christian Cole Cody David Finlay Dragon Lee EVIL G1 Special in USA Gedo Guerrillas of Destiny Haku Hangman Page Hanson Hiroki Mikami Hiromu Takahashi Hiroshi Tanahashi IWGP Intercontinental Title Match IWGP Junior Heavyweight Tag Title Match IWGP US Heavyweight Title Match IWGP US Heavyweight Title Tournament IWGP US Heavyweight Title Tournament Final Match IWGP US Heavyweight Title Tournament Semi-Final Match Jay Briscoe Jay Lethal Jay White Jim Ross Josh Barnett Juice Robinson Jushin Thunder Liger Katsuhiko Kanazawa Kazuchika Okada Kazuki Kusanagi Kenny Omega Kenta Sato KUSHIDA Long Beach CA Long Beach Convention and Entertainment Center Makoto Abe Mark Briscoe Marty Asami Marty Scurll Matt Jackson Michael Elgin Milano Collection AT Nick Jackson NJPW Raymond Rowe Red Shoes Unno Ricochet Rocky Romero Roppongi Vice Sanada Shinji Yoshino Sho Tanaka Tama Tonga Tanga Roa Tetsuya Naito The Briscoes Tiger Hattori Titan Tomohiro Ishii Volador Jr. War Machine Will Ospreay Yohei Komatsu Yoshi Tatsu Young Bucks Yujiro Takahashi Zack Sabre Jr.